Diggers Valley: 17 October 2015. The week beginning the 17th of October 2015. I realised I hadn't seen the goose when I moved the sheep the other day, so walked up to look for her. She was coincidentally just getting off her nest, making her presence obvious by a lot of hissing, to go off for a walk around and to feed. 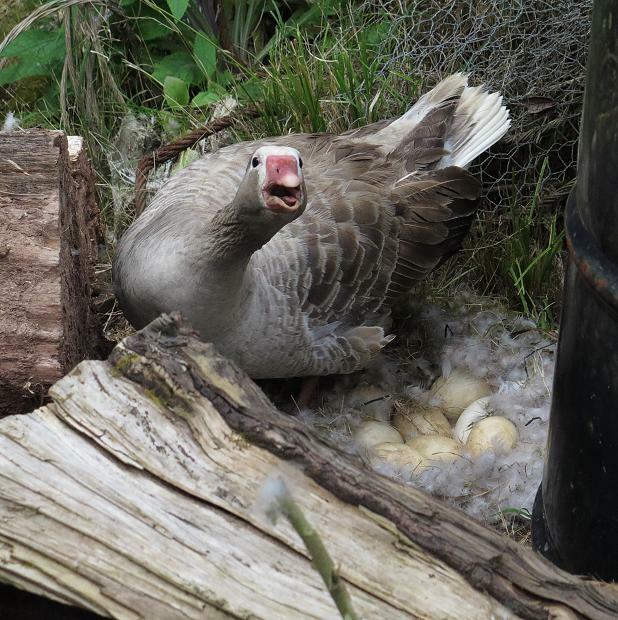 She has eight eggs. I got the torch to see if they were fertile or not but I suspect, from the cleanliness of the latest-laid, that she has only just started sitting on them. Today's job was a crazy scheme of Stephan's, to move this concrete slab which was once the floor of the vat room in the old dairy shed by the round-about. 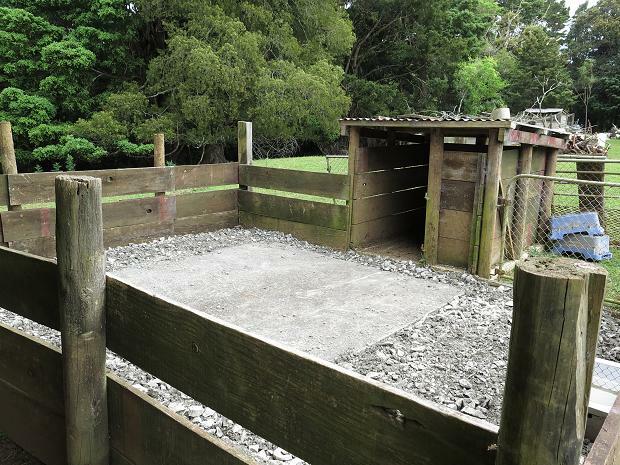 Since Stephan demolished what remained of the shed several years ago, the slab has sat on top of the remaining concrete by the yards and generally been in the way. While this was happening, 718 was privately having a calf in Flat 2. She's a stroppy madam, so probably best she did it without my watching presence. 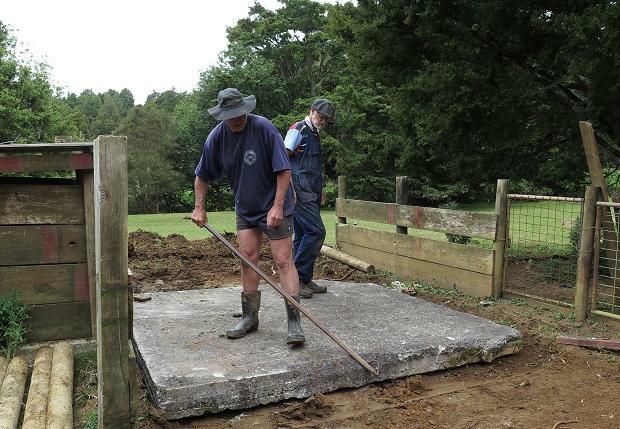 Since the last pigs turned the pigsty enclosure to swill, Stephan has had a plan to bring the slab over here to provide a firmer base for the next pigs when conditions get wet. While they seem to rather like mud, they're better being able to keep clean and dry when they want to. It took about three hours to get it here, which was less time than it would have taken to box the area and make and pour concrete. Re-use of old materials is much more fun. 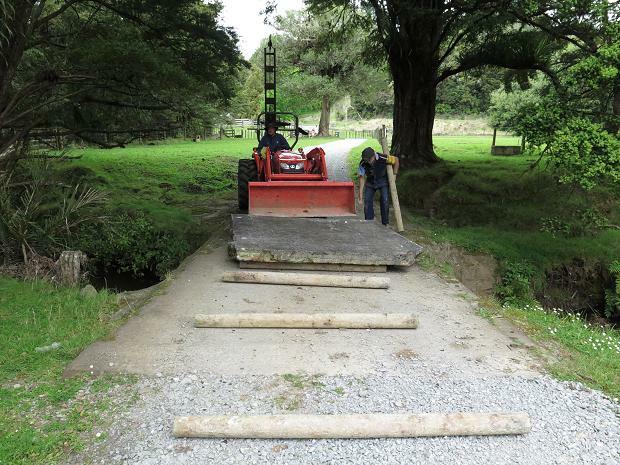 The ground is now dry and hard, so moving the slab across the paddock with the tractor made no mess at all. We've only had 25% of October's normal rainfall so far this month, a mere 34mm. While they were finishing off and then building surrounding railings, I went off to get the weed-wiper, refilled it with the 33% mix of Glyphosate with a bit of wetting agent mixed in and attacked some of the still-living sedge plants around the paddock. 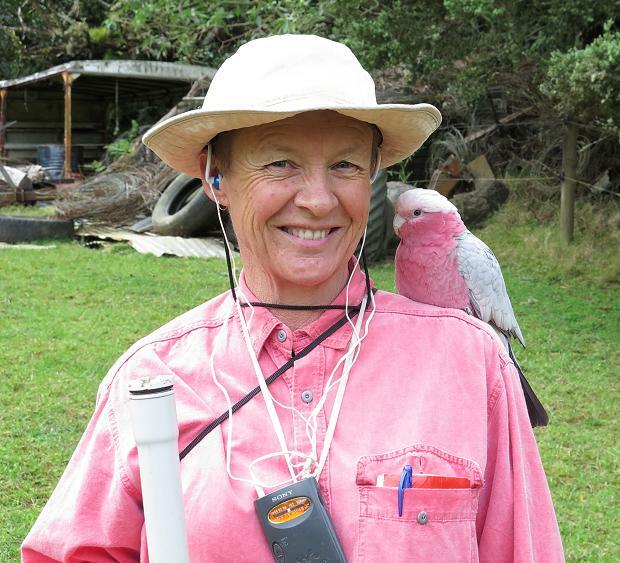 Stephan came and grabbed my camera, saying he needed to record the weed-wiper with the parrot on her shoulder. Floss sat there while I worked, quite happy to be out and about. Lucky this year's sun-protection shirt is such an appropriate colour! 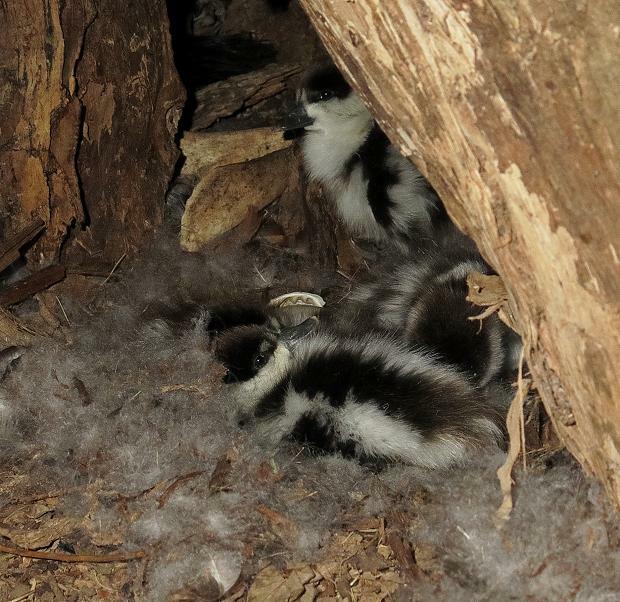 The Putangitangi chicks in the big tree nest have hatched. I was quite concerned when I arrived there because there were flies buzzing in and out of the nest and I wondered if something had gone wrong. But those I could see all looked quite healthy and active. 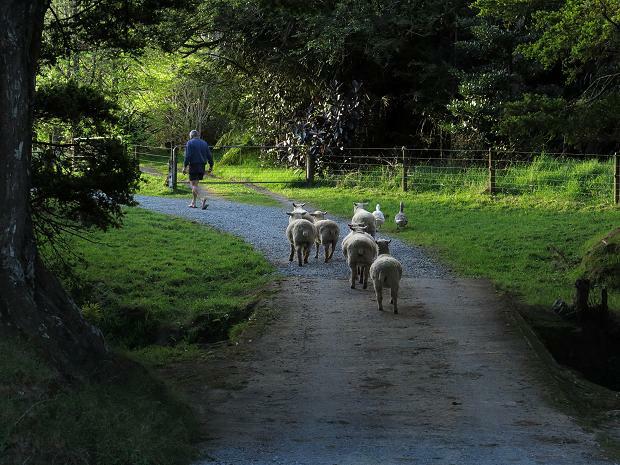 The sheep have been grazing the Pig Paddock by the driveway but having heard from someone just down the valley that he'd lost a number of his sheep from beside the road, we've been bringing ours in nearer the house each night. Tame sheep are easy game for passing poachers and I would not like any of them to suffer such a fate. 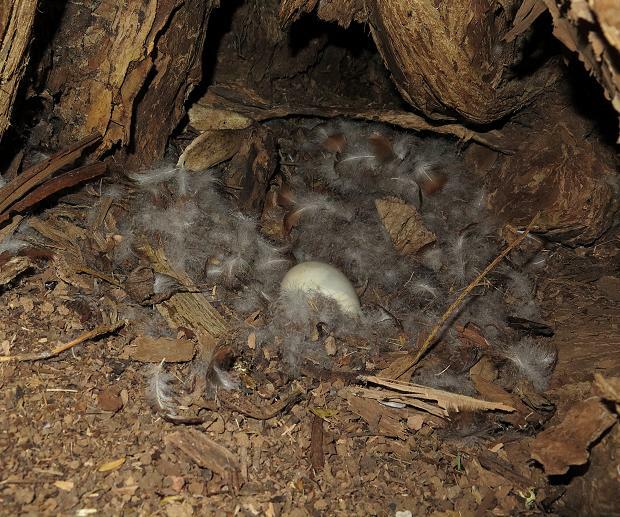 The now deserted Putangitangi nest with one rotten-looking egg. That might explain the presence of so many flies yesterday. I may never see these chicks again, because their parents are generally very good at keeping them out of the way of people. But later, when I rode up and around the corner of the Mushroom track, a male Putangitangi flew up from the stream and flapped off across the paddock in his "I have a broken wing, follow me" act. 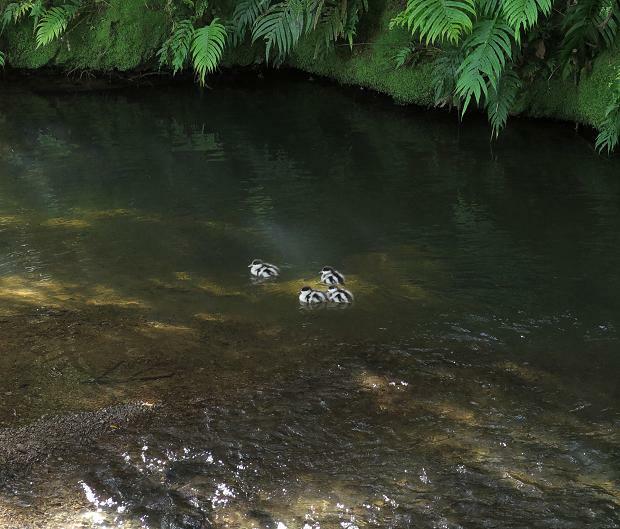 Both parents then tried to draw my attention away as I ignored them and climbed through the fence to look down into the stream. These could be the chicks from the tree nest, but could equally be those of the pair which I usually see in the Mushroom and Bush Flat paddocks. Clematis flowers are generally difficult to photograph, growing high up in other trees and being blown around in the spring winds. 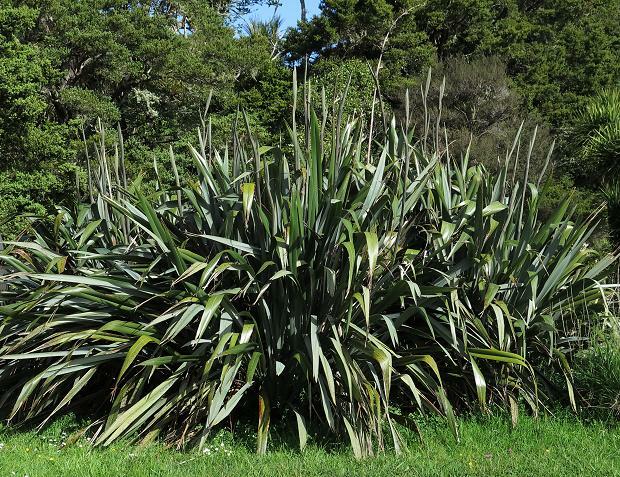 I was luckier in earlier years, with the plant which grew in a small tree up the top of the Big Back North paddock. Sadly that vine died a couple of years ago. This one is new though, or at least I had not noticed it before this season, just beside the Back Barn gateway. This heifer (107's daughter) has the characteristic facial hair pattern of several of her family, including unfortunate Aunt Victoria, her hair growing down her whole face from a central whorl on her poll. She's pretty; I hope she turns out well. 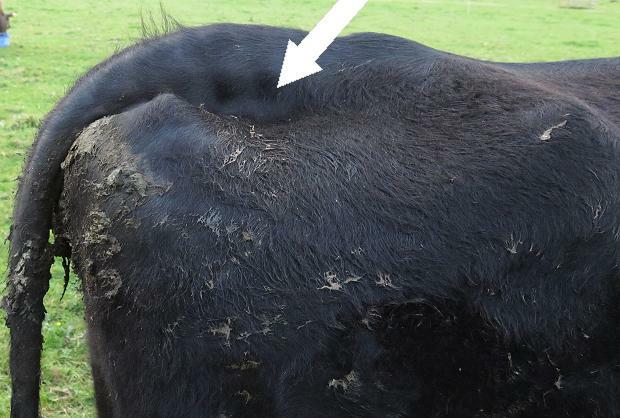 The approach of Demelza's time for calving is fairly obvious because of the way her pelvic ligaments loosen and change her external appearance. Very noticeable dips appear in front of her pin bones, which seem to have risen and now poke up under her skin. The changes usually make the tail head rise above the line of the spine. 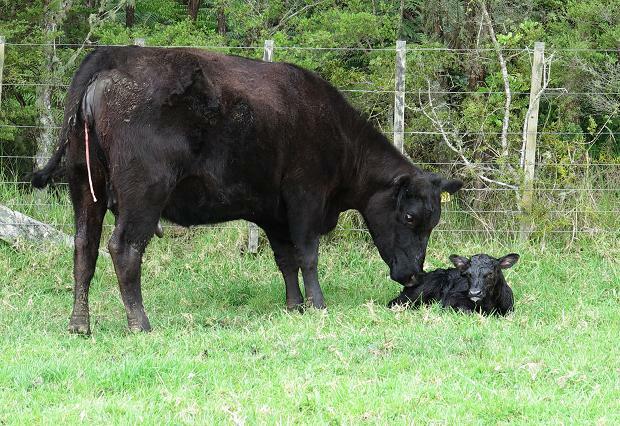 Demelza's three-year-old daughter Ellie 119 had a little bull calf in the early hours of this morning. When I went out for my late check tonight, he was curled up beside his mother, sheltered by her body from the breeze, with his forehead pressed against her back. I came out again at 2.40am and Demelza was obviously in labour, but the nature of the look she gave me and the way she moved when I approached her made me decide to leave again. Even the most placid and tame cow can become a danger during and after birth and on a dark night when torchlight can confuse them, it's safer to get out of the way unless interference is vital. All went well for Demelza and at first light when I looked out from the house, her latest daughter was skipping around her. I must get the pedigree tables updated so I can think about who these calves are. This one's sire was Ida's son, 128, Demelza's first cousin. Loofah Equilibrium has hatched four new chicks and is looking after them well this time. I took the four unhatched eggs, shone a torch through them to see which ones were fertile (the infertile ones are clear with only a little yellow from the yolk, the ones with chicks in have obvious solid areas with the air sac at the wide end) and put the three with chicks developing into the other nest box in the little cage the four adult birds share, having removed that bird's eggs, all of which were infertile. 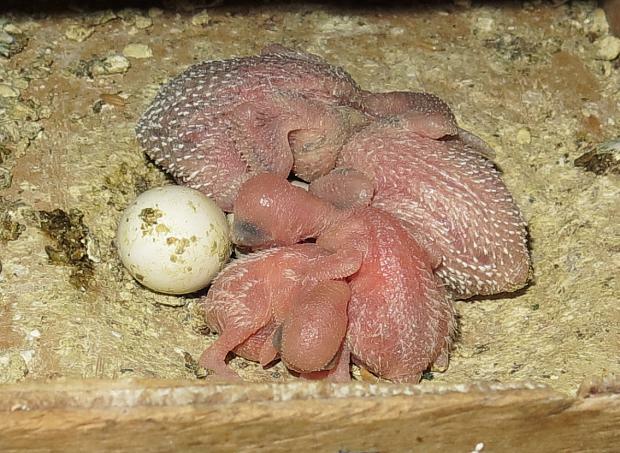 It seemed sensible to distribute the chick-rearing load more fairly. I don't know much about this business yet and am reading and learning as I go. 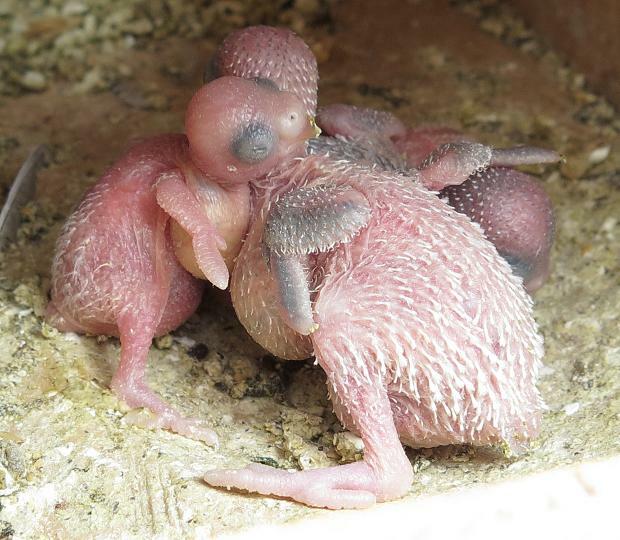 So far I have learnt that chicks which are going to survive grow extremely quickly and have obviously full crops right from the start - filled with a pale substance regurgitated from the mother bird, plainly visible through the very thin skin at the base of the neck. A lot of them lie flat on their backs waiting to be fed, which looks very comical. 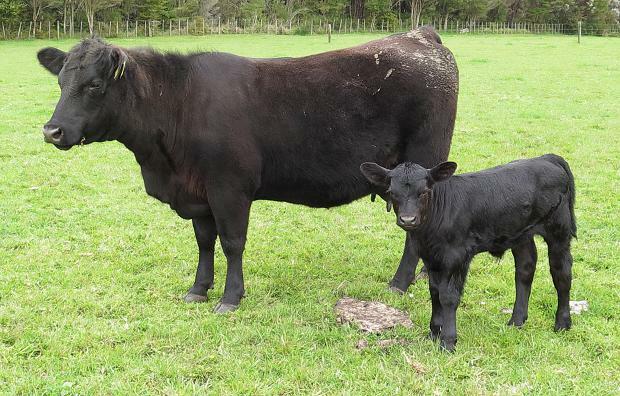 Curly has a son this year, a normal straight-haired black calf. After several years sitting in the near dark in our living room because the halogen lights we originally had installed gradually stopped working, we now have new LED lights to replace them. It's like daylight in the living room when they're all on! White-faced 714 at the rear, with latest daughter by the gate and two-year-old daughter 749. I don't think the black calf is part of the family but it was nice to see the obvious family members standing near each other. 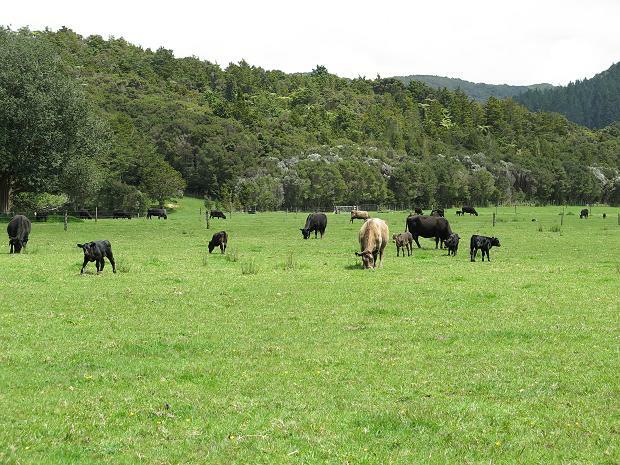 I combined the two mobs of heifers/cows on Monday, drafting out the two two-year-olds still to calve into the neighbouring paddock so they're easy to spot. 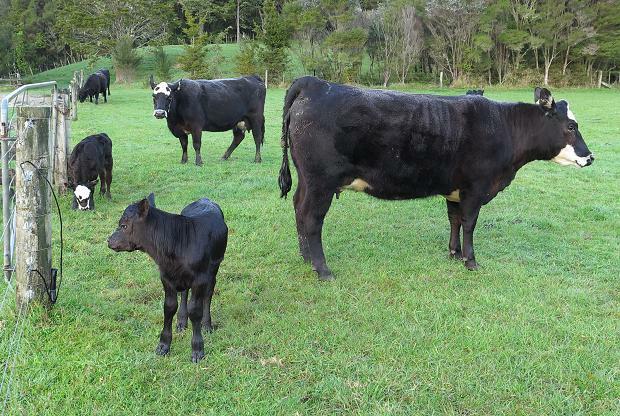 726 wouldn't draft out easily when I shifted them, so stayed with the big mob with their calves and produced her own this afternoon without me seeing anything happening at all. She has a daughter, her second. I'm really hoping she'll produce more milk this season than she did last; she's on a "last warning". 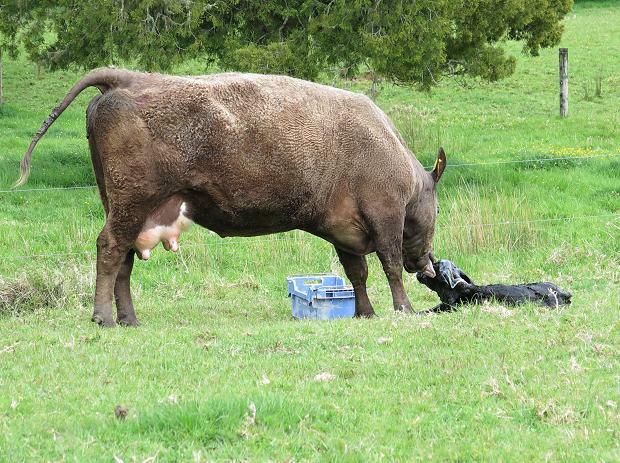 Dexie 101 had a heifer, another bull 87 daughter. He won't last forever, so it's nice to have a number of daughters to choose from. I saw some of her labour - one of those where I make sure the right sort of feet are coming out, followed by a nose bulge or a bit of tongue, then leave them to it. I was coming down with something nasty - that stingy eye feeling with sneezing and snuffling. Great. Weird birds, growing like weeds. I don't think I'm supposed to do anything for them... will have to check. Dinky 94 spent the day worrying me. Early this morning she was trying to steal Demelza's calf, a good sign she was about to begin labour, but then other than occasionally holding her tail out a bit and looking distracted, nothing else happened. After lunch I set up some tapes to make a lane ready to take her in to the yards if she didn't show some sign of getting on with having her calf, but that's primarily something I do to pass the time and distract myself. By the time I finished, things were looking a bit more like action, although it wasn't until just before 5pm that a couple of feet appeared. There was still so little progress after that, that I decided to help her. 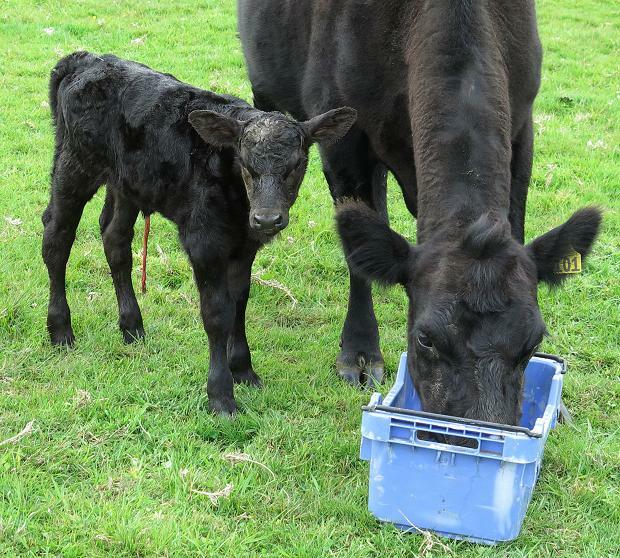 When she lay down to have a bit of a push, I slipped one of the calving chains I'd brought from the shed onto one of the calf's legs. A little later, after pulling that leg a bit, I got one on the other leg; fortunately Dinky didn't seem too perturbed by their presence, especially when she stood up and I didn't have time to get one of the handles unhooked from the end of the chain. She walked around making a gentle jingling noise. The chains have to be placed quite carefully, so as not to damage the calf's legs and it's all terribly slippery and wet! Before I pulled on them when she lay down, I checked they were still in the right place. After this picture she eventually lay down again and I put the other handle on and sat back on the grass behind her to pull with each of her contractions and hold between them, to help her get her baby out. I knew he was still alive, from the occasional foot movement, so wasn't too worried about the time it was all taking, except that she'd get tired and he would eventually suffer from being stuck for too long. I don't know why she took so long. I guess the weird spring may be affecting some of the cows so that their labours are not progressing quite as they should, but I don't really know. The calf was fine, up and feeding by dark, the 25th calf for the season. 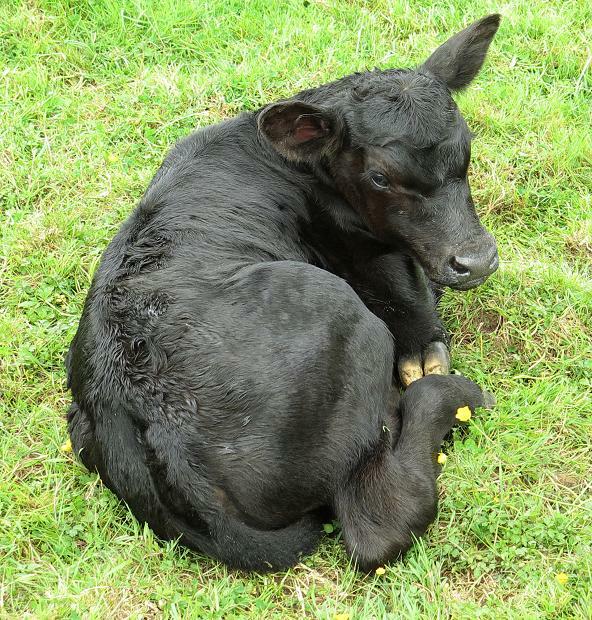 Here is that little calf, Dinky's son. Fancy 126, my favourite yearling, lay down with a gush of birth fluids as I arrived to check last night. The night was reasonably chilly and I have a horrible cold (and you know how I feel about being sick during calving!) so I went home for a while for a hot drink and to change into thermal long-johns. An hour later when I returned to the paddock everything looked much the same, but of course there had been progress and before very long a membrane bag appeared and a few minutes later, just after midnight, I could see feet. While 126 was quietly getting up and down, I lay beside the fence on the ground nearby, with my head on my torch, snoozing, feeling too ill and tired to stay upright. It's not the first time I've slept out in the dark while sick and waiting for a birth. Just before one, I stepped in to help, pulling on the legs as the head gradually came through. The calf's tiny little tongue came snaking out and around my finger when I felt her mouth. That has to be the most delightful part of being able to be so close: that sense of meeting a new being before it is even born. It was a pretty easy birth for a heifer and Fancy was extremely calm about my near and interfering presence. When the calf was out on the ground and Fancy was up and licking it, I took my confusing torch light away and went to bed. 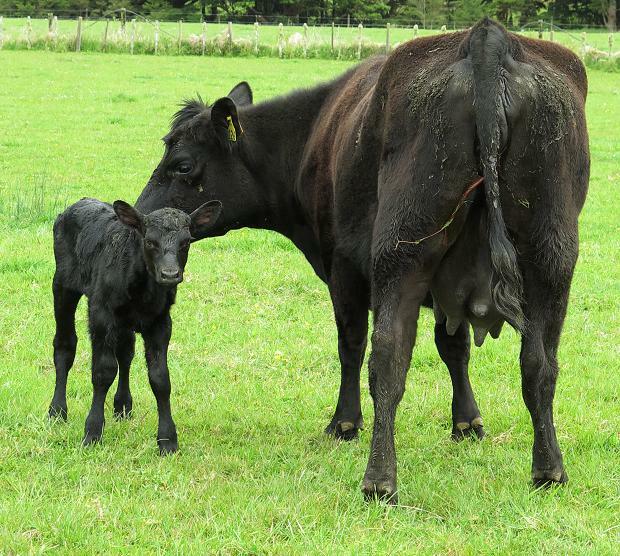 743, the very slow labour heifer, with her solid little son. I think she's going to be a very impressive cow! 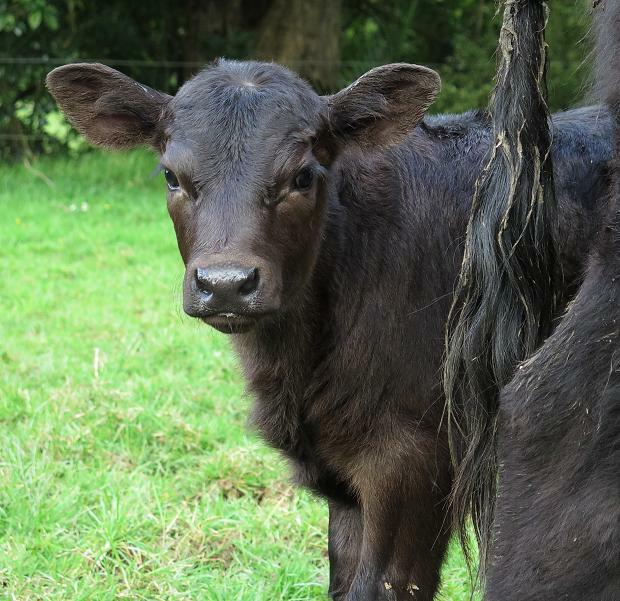 We're filling up the flats with cows and calves! 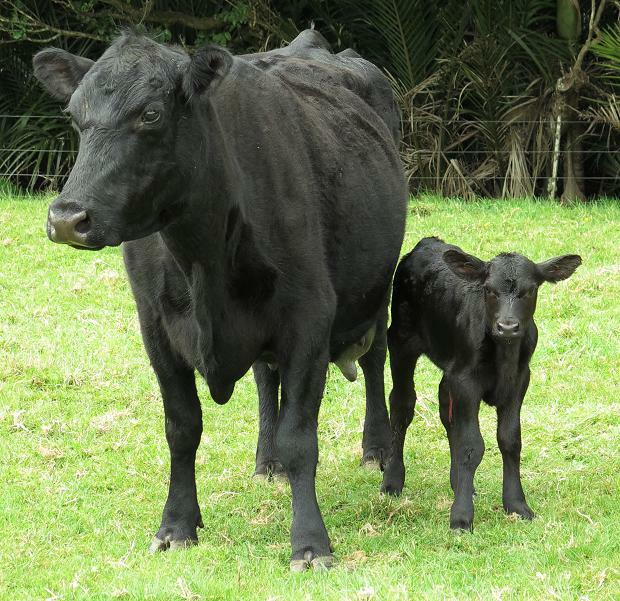 We should, all continuing to go well, have 36 calves by the end of calving, two with the house-cows and so I will create two 17-calf mobs from the rest. Mobs of that size make management through the yards nice and easy and they're a nice-sized group to keep track of out the back of the farm. Today I pushed the 12 heifers and their calves back to Flat 3 and brought the five cows and calves from the Tank Paddock to Flat 2, so they can get to know each other a little before we combine them in a couple of days. 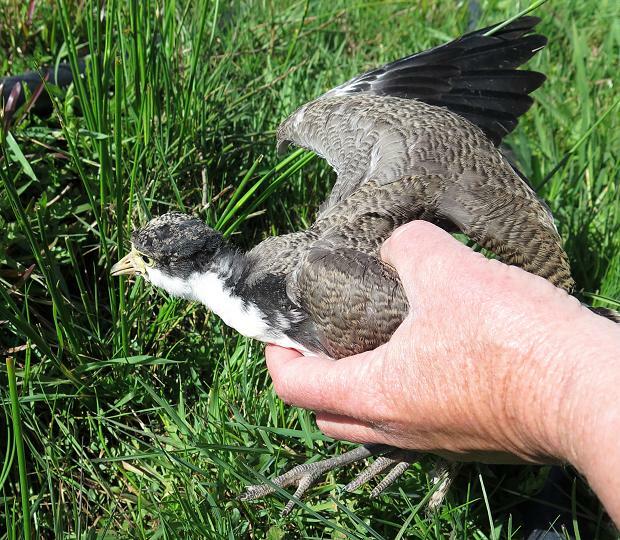 I rode down along the Windmill lane and accidentally caught up with a Plover chick, which burrowed into some grass in the drain. I stopped for a closer look and gently drew it out to hold it for closer inspection. Their wings look big enough for them to fly, but they haven't yet taken to the air. I'm always amazed by how quickly they grow. 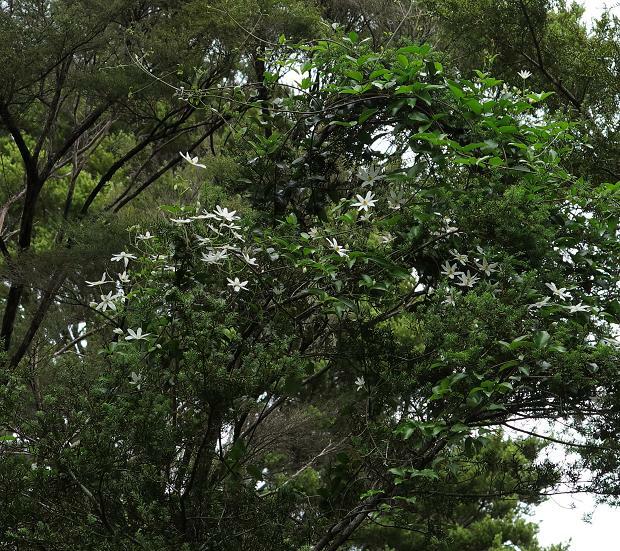 In the strong breeze today, I kept seeing what looked like smoke in the trees; it was Totara pollen, being released in great clouds as the breeze disturbed the trees. This is the new plan for keeping pigs happy: half a load of lime-rock as firm ground around the concrete slab in the sty. There's not much point trying to grow grass in this enclosure, because the pigs very soon eat and dig it all up, so the ground might as well be made to remain firm when conditions are wet. This year Stephan plans to put rings in the pigs' noses to stop them rooting up the ground and then letting them out to graze on the rest of the paddock's grass. 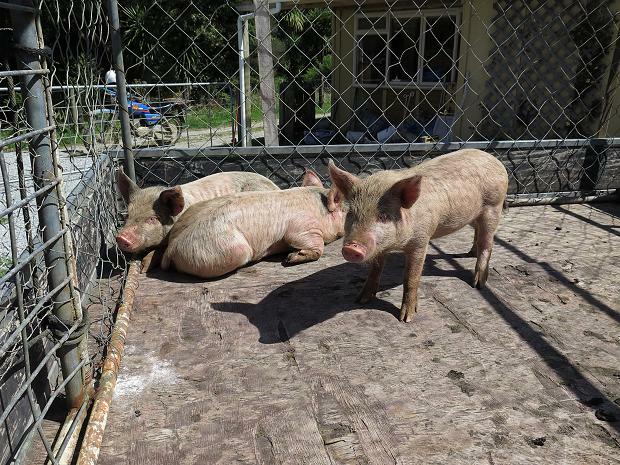 This year we bought pigs from the same breeder as those of four years ago. 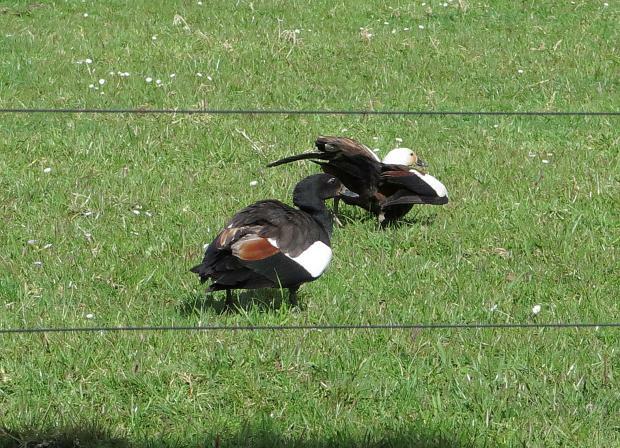 There are three, their rearing, feeding and care to be undertaken by three lots of us in the wider family. After last year's poor flowering (with only about six stems on this group), it looks like the Flax bushes are going to have a bumper blooming year again, even better than 2013. There are two old dried stems in there which I've not been able to reach to remove, but the others are all new flowers. The old ones provide an interesting height reference as the flower stems seem to get taller every year.